Today we climbed 2700m and then descended back down to about 1500m before stopping for the day. Suffice to say it was mountainous and a good few hours of up and down… up and down, and around the something like 15 landslides covering part or all of the road. It’s obviously rained here quite a bit recently – a significant amount of the mountain was actually covering the road! Trees and all. Speaking of roads – Adrian has pointed out that in my post yesterday, when discussing the road chaos, I neglected to mention the fact that it wasn’t just the lovely three lanes of tunnels that turned into two lanes of dirt… it was also three lanes of traffic that had travelled overland to get to the same point. And one of the two lanes was effectively a parking zone, where cars/taxis/trucks etc stopped for reasons unknown to me but which appeared to include (a) to say hi to someone by the side of the road; (b) to pick up or drop off a passenger; (c) to have a sleep; (d) to buy something from a roadside vendor; (e) to have a break. So it was as if you were travelling north from Sydney’s CBD either through the tunnel or over the bridge, and just as you hit the Warringah Freeway, it disappears into a single useful lane, on a dirt road. In peak hour. On a Friday afternoon. Anyway, back to today. The further we got from Puerto Escondido and the higher we climbed, the cooler it got… so the riding was actually more comfortable than it’s been for a while.. at least in terms of hydration and the lack of sweat running down my back and legs, pooling – and gently simmering – in my motorcycle boots. The windy road through the mountains took us through numerous small villages. We’d been warned, via other blogs, that this was a road on which dogs went after motorbikes, fanging for riders’ legs in fits of frothy, rabid excitement. And so they did. And because we have to ride so slowly through the villages due to the topes (which even cars, that haven’t been lowered, go over at an angle to avoid bottoming out), a couple of the dogs got mighty close. It didn’t help that I’d seen a dog eating a (dead) dog earlier in the day… so I knew they were serious when going for our legs. 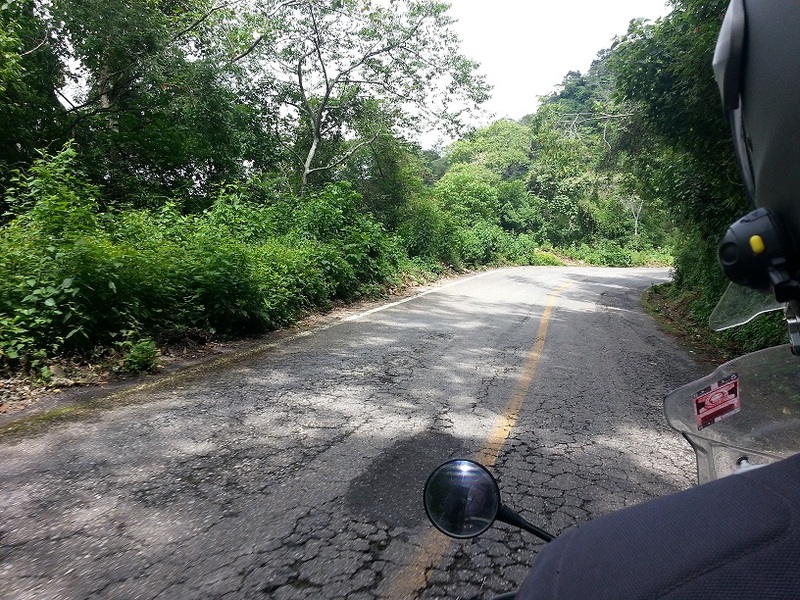 Part of today’s road – this was the ‘good’ section of road we travelled on. When we weren’t watching for dogs, however, the view was just spectacular. A Mexican mountain experience I doubt many tourists experience – and one I recommend. In particular, the terraces of corn lined up along steep mountain slopes like soldiers on parade provided a comforting sense of visual order which is in complete contrast with some of the hodgepodge, ramshackle towns. And it was good motorbiking, too. We found our hotel after another mercifully short period of Mexican city centre motorbike riding – and, after a walk around the old town to get our bearings, had possibly the worst dinner of the trip so far! If you travel to Oaxaca, I recommend avoiding the local specialty, Oaxaqueno mole… or at least make sure the place where you do decide to try it comes recommended; it’s possible we just had a bad experience. Based on our experience, however – which is all I’ve got to go on – it looked like a sort of tarry slop, and didn’t taste much better. Kind of a combination of melted dark chocolate mixed with smoky BBQ sauce. Why we both thought it necessary to try the local specialty and ordered a serve each I don’t know… suffice to say that one of us (the somewhat larger one) needed to get a pizza chaser after we left the restaurant!! 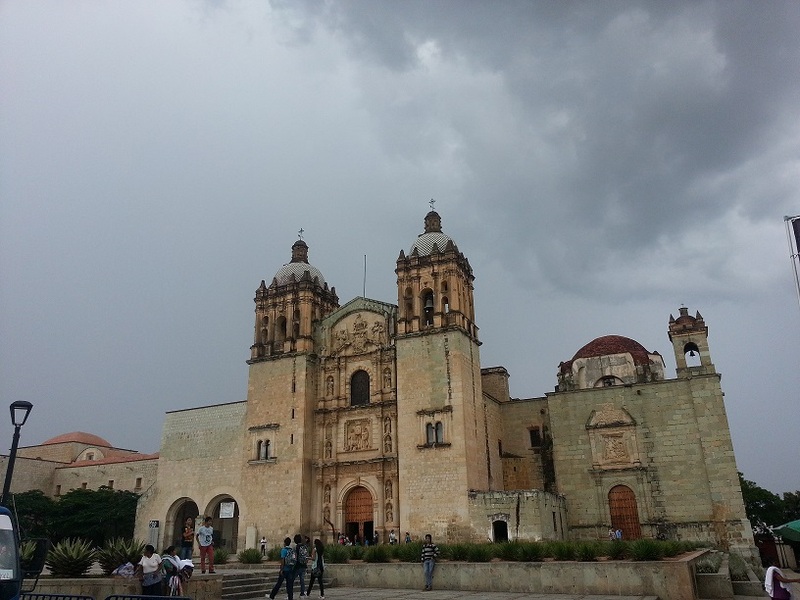 We also stumbled across the start of the Rally Sierra Juarez – a road rally through Mexico. You know it’s serious when the driver and navigator have their blood types painted on the outside of their car…! 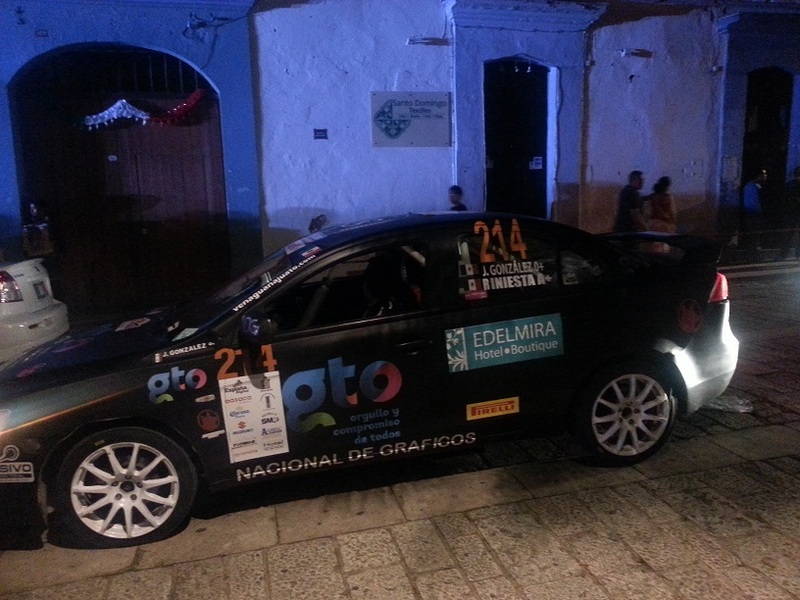 A car getting ready for the rally which started in Oaxaca…. if you look closely, you’ll see blood types for both the driver and navigator on the back window!! !